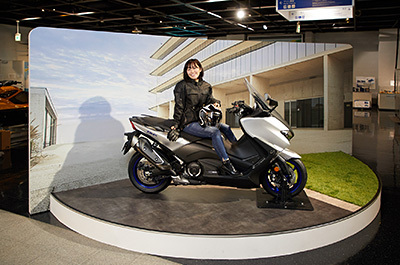 Lifestyle Exhibit: Scooters - Communication Plaza | Yamaha Motor Co., Ltd. 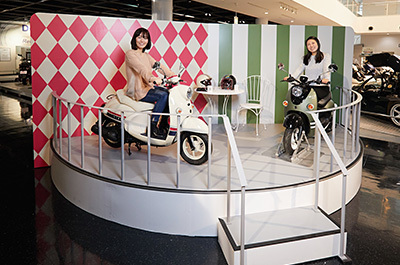 The theme for the Lifestyle Display Area from March is “a fun life with a commuter bike that fits your style.” Do you prefer a scooter for short trips around your neighborhood or do you prefer a do-it-all scooter that can also hit the highway? Maybe you prefer one with cute, fashionable exterior or maybe you prefer a sportier, urban design. Does a smaller, more agile model that is convenient and easy-to-use strike your fancy, or do you look for comfort that doesn’t compromise on a fun ride or practical features? Though they are both “commuter bikes,” the Vino and TMAX differ greatly in their character, size and typical uses, and we’ve set up this lifestyle exhibit with backgrounds that match each model’s image. This lifestyle display allows you to step onto the stage. Feel free to get a closer look, touch and take pictures as you decide which model suits your style best. The Vino is a 50cc scooter popular for its retro-pop styling and its light, agile ride. The TMAX is a “sport commuter” model that combines the fun of a sport bike with the comfort and convenience of a scooter.